And like that, October is over. I’m going to miss this sweet month of warm/cold weather, good Fall vibes, and even greater reads. September and October feel like the same months. It’s getting a little bit colder, but not enough to necessitate a heavy coat or many layers. In fact, the weather has been so erratic this month that just yesterday my boyfriend was wearing shorts outside. This morning we woke up to the chill that comes with winter. We’re still a ways away from that and I hope it doesn’t arrive for quite some time. Anyway, onto the books. 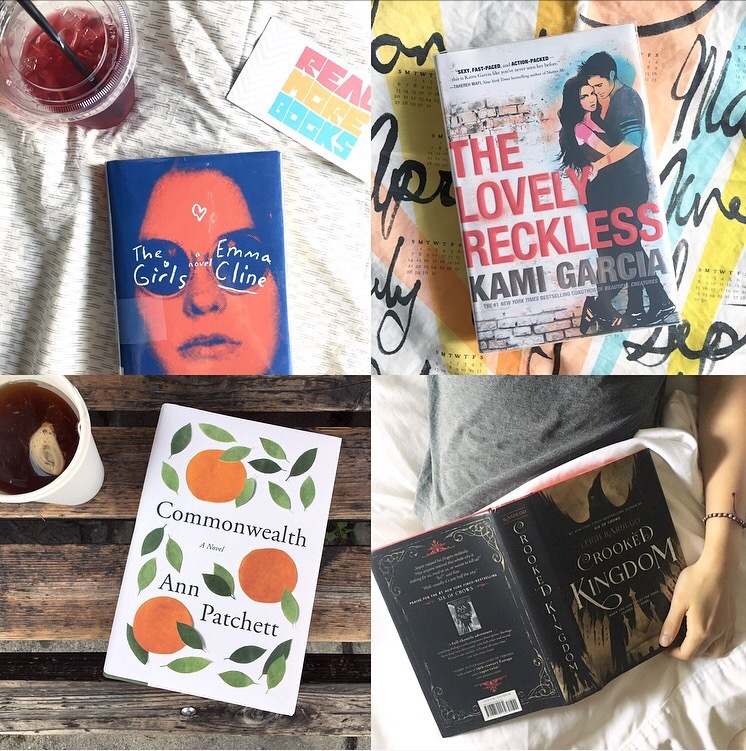 I love that I create these TBR lists or book hauls with full intention of reading them all within the month, but the truth and reality of it is that I’m a slow reader with a changing fascinating with genres. I can’t stick to what I set myself out to read! The Girls by Emma Cline (3.5/5 stars) – Northern California, during the violent end of the 1960s. At the start of summer, a lonely and thoughtful teenager, Evie Boyd, sees a group of girls in the park, and is immediately caught by their freedom, their careless dress, their dangerous aura of abandon. Soon, Evie is in thrall to Suzanne, a mesmerizing older girl, and is drawn into the circle of a soon-to-be infamous cult and the man who is its charismatic leader. Hidden in the hills, their sprawling ranch is eerie and run down, but to Evie, it is exotic, thrilling, charged—a place where she feels desperate to be accepted. As she spends more time away from her mother and the rhythms of her daily life, and as her obsession with Suzanne intensifies, Evie does not realize she is coming closer and closer to unthinkable violence, and to that moment in a girl’s life when everything can go horribly wrong. The Lovely Reckless by Kami Garcia (4/5 stars) – Seventeen-year-old Frankie Devereux would do anything to forget the past. Haunted by the memory of her boyfriend’s death, she lives her life by one dangerous rule: Nothing matters. At least, that’s what Frankie tells herself after a reckless mistake forces her to leave her privileged life in the Heights to move in with her dad—an undercover cop. She transfers to a public high school in the Downs, where fistfights don’t faze anyone and illegal street racing is more popular than football. Commonwealth by Ann Patchett (4/5 stars) – One Sunday afternoon in Southern California, Bert Cousins shows up at Franny Keating’s christening party uninvited. Before evening falls, he has kissed Franny’s mother, Beverly—thus setting in motion the dissolution of their marriages and the joining of two families. Crooked Kingdom by Leigh Bardugo (5/5 stars) – Kaz Brekker and his crew have just pulled off a heist so daring even they didn’t think they’d survive. But instead of divvying up a fat reward, they’re right back to fighting for their lives. Double-crossed and left crippled by the kidnapping of a valuable team member, the crew is low on resources, allies, and hope. As powerful forces from around the world descend on Ketterdam to root out the secrets of the dangerous drug known as jurda parem, old rivals and new enemies emerge to challenge Kaz’s cunning and test the team’s fragile loyalties. A war will be waged on the city’s dark and twisting streets―a battle for revenge and redemption that will decide the fate of magic in the Grisha world.